Twas the week before Christmas when every brandista was stirring, even the quiet ones! LOL! 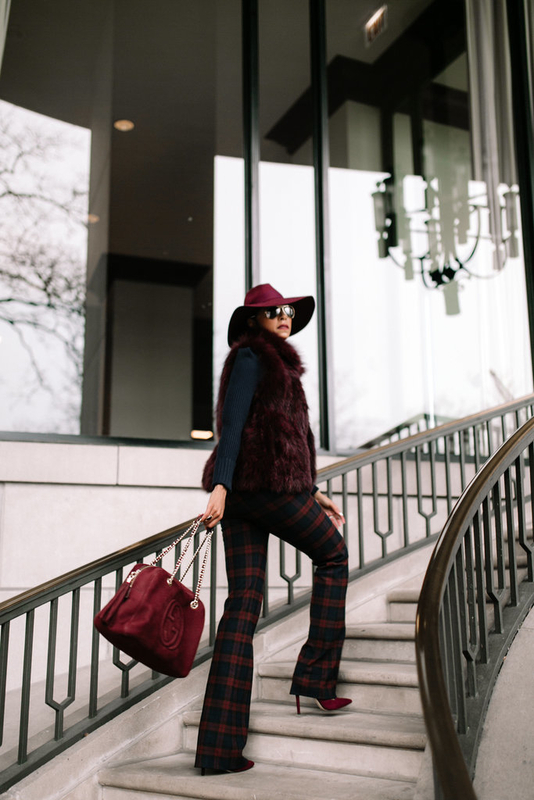 Sparkles, glitter, ivory with bling, everything black or gold with a touch of FIRE engine red here and there is how my personal style is showing up this holiday season. I style my outfits according to my mood- maybe this consistent style is a reflection of my obsession with things that shine brightly and are pretty; yet, manage to hold a sense of simplicity, or maybe not. Throughout the last two weeks, I’ve flaunted my fair share of gold tops, champagne skirts, black dresses, and glossy lips catching up with family and friends. Of course, there are the fancy ‘smancy’ black tie holiday parties, 2pm tea dates, and the occasional dinner before the holiday party shenanigans we look forward to getting dolled up for this time of the year. I’m not sure how we’ve (myself included) come to packing in so many fireside chats and holiday mixing within such a short window of opportunity but we do, and I’m taking advantage of giving and receiving tons of love, hugs and holiday cheer. As I’m hurriedly winding down my workload for the year, and full swing in planning mood for 2018- I’m prioritizing time in between to catch up with as much of my tribe as humanly possible. The last few days have been a whirlwind of travel and parties that’ll continue through the new year. I left Chicago with my husband last Friday for Jacksonville, Mississippi where we caught up with friends at a regional Boule holiday party at the Westin Friday night after losing myself in some delicious, smothered turkey necks (drenched in hot sauce-of course), mac and cheese, and cabbage. YUMMY! We ate the food at a delicious authentic soul food spot called Bully’s. You can take the girl out of the country, but never the country out of the girl. On Saturday, we headed to Downtown Jackson to the Mississippi Civil Rights Museum where my husband sat on a panel to discuss wealth building, followed by a tour revisiting the mind-boggling account of African American History from slavery through the Civil Rights Movement, and the progression those families in Mississippi have overcome in spite of the horrendous conditions their families once endured. As tough as it was revisiting graphic images, watching videos and reading intimate accounts of story after story of dehumanizing accounts of the torture, hatred and bigotry that shaped the period, it served as a timely and extremely humbling reminder of my own history that fueled something deep inside my soul. Resulting in a commitment to myself, to forge forward being my absolute best self and pushing myself daily to only do work reflective of my values. Saturday afternoon we checked into the St. Regis hotel in Buckhead, got all fancy and left for the 60tth Mayors Masked Ball After The Ball party at the High Museum. On Sunday, I celebrated one of my closest friends birthday over champagne, a petit lobster pot pie, Georgia Bank scallops and fried oysters at Atlas in the St. Regis, prior to dancing our as$es off. Tuesday, I met another friend at Atlas for a powerful reconnecting session over lunch and learned all about her year of becoming a certified yoga instructor, traveling and rediscovering herself after divorcing and embracing motherhood as a single mom. It never ceases to amaze how much we can continue to learn, support one another and evolve in our friendships. The more transparent and vulnerable we are with our friends, the deeper those relationships develop and the sooner we realize how parallel our journeys have been. Les and I flew home on Tuesday night, Jala got in from NYC on Wednesday and of course, we celebrated her: a successful semester at Syracuse down and all her happy, healthy energetic 19-year-old glory of magic by having a seafood feast at home, admiring our holiday decor and rocking to Merry Christmas by Mariah Carey and One Wish: The Holiday Album by Whitney Houston. Earlier today, I left to finish some holiday shopping and grab a mid-morning coffee with a girlfriend to say hello, exchange gifts and share hugs. In true holiday fashion, I threw on a very fashionably chic, on-trend below the knee pleated skirt, a gold off the shoulder sweater, my favorite Tom Ford over the knee boots (click for a similar pair) and a cropped little leather bomber number (dig deep enough, I’m sure you have one somewhere too), I’ve had for over ten years and felt amazing! Style is truly timeless. I completed the look with a little Chanel cross body, gold hoops, Bobbi Brown lip gloss and a thankful heart. While I’ve been busy traveling and will head out to Charleston, SC tomorrow to spend time with the family before heading to Atlanta to bring the new year in with friends. I’m smelling the roses, being grateful for the people (you included), circumstances and blessings that continue to flow and thanking God every step of the way!